A little over a week ago, the 16th Annual San Francisco Silent Film Festival wrapped up at the Castro Theatre, providing moviegoers not only with the opportunity to see some of the most invigorating visions ever put to celluloid (the festival’s typically stellar programming this year included F.W. Murnau’s inimitable Sunrise; Yasujiro Ozu’s sublimely bittersweet I Was Born, But…; and the bristling psychodrama He Who Gets Slapped, featuring a moody performance by Lon Chaney and elegant direction by Victor Sjöström) but also providing live musical accompaniment by acts such as the Alloy Orchestra, Stephen Horne, Dennis James, the Matti Bye Ensemble, Mont Alto Motion Picture Orchestra, and Donald Sosin. Rare though they may be, theatrical screenings of silent movies pop up occasionally nationwide at cinematheques and specialty theaters. When they do, it’s best not to pass up the opportunity: watching silent film encompasses a seemingly alien form of seeing and processing stories told on celluloid. A contradiction seems to lie at the heart of silent cinema, especially with the benefit of a century of hindsight: from (approximately) 1895 to 1930, the foundational rules of cinematic narratives were conceived of and perfected by pioneers like the Lumière Brothers, Georges Méliès, and D.W. Griffith, allowing us to see in their early films the nascent grammar that has remained relatively consistent throughout one-hundred-plus years of narrative movies; yet at the same time, a spirit of experimentalism and innovation reigned, precisely because those aforementioned rules had not yet coalesced into a systemized code of storytelling. Silent film enthusiasts already know full well that even the most mainstream movies made from 1915 onwards (the point at which a so-called cinema of narrativity more or less supplanted a wildly diversified cinema of attractions) were defined by a giddy experimentation with spatiotemporal consistency, an indulgence in breakneck absurdity and surrealism, and a mind-expanding reconsideration of the ways in which ideas and themes could be conveyed visually. My favorite examples: Louis Feuillade’s crime serials Fantômas (1913) and Les Vampires (1915-6), funded by France’s titanic Gaumont company, featured countless fragmentations of real and screen space that displayed an intuitive knowledge of how to shock and bewilder audiences; American silent comedies like The Kid Brother (1927), Sherlock, Jr. (1924), and Pay Day (1922—released by Paramount in the first case and early vestiges of the MGM Corporation in the others) steamrolled forward with astonishing energy and unbridled imagination (modern comedies rarely even attempt such kineticism); and state-sanctioned Soviet projects, when left in the hands of artists like Sergei Eisenstein or Aleksandr Dovzhenko, resulted in movies as audacious and fascinating as Strike! (1925) or Arsenal (1929), which were propaganda only in the most literal sense and were dominated by groundbreaking, ingenious marriages of form and content. In short, watching the majority of silent movies today feels at once like foreshadowing of the art form that was to follow as well as a refutation of it. Maybe even more than silent American, French or Soviet cinema, however, the films of Germany’s Weimar Republic, dating roughly from 1918 to 1933, pushed at the boundaries of what stories, ideas, and aesthetics could achieve on film. This incredibly rich period of production included works by: F.W. Murnau, whose Nosferatu (1922) immortally etched film horror into light and shadow, and whose The Last Laugh (1924) liberated the camera, allowing it to swoop, stumble, climb, and careen in order to convey the psychological tumult of its main character; G.W. Pabst, whose intense and influential brand of symbolic realism included such films as Joyless Street (1925) and Pandora’s Box (1929); Fritz Lang, one of the most assured early film stylists (and an undeniable influence on Hitchcock), who nearly bankrupted UFA Film Studios with the epic Metropolis (1927) and concocted a supervillain nefarious enough for interwar Germany with his Dr. Mabuse films; Walter Ruttman, whose formalist collage of Berlin’s sights and sounds, Berlin: Symphony of a City (1927), pulsed with the energy of the modern metropolis via the stylistic breakthroughs made possible by the cinema (much like some sequences in Dziga Vertov’s Man with a Movie Camera ); and Robert Wiene, whose Cabinet of Dr. Caligari (1920) conceived of a filmic world that was resolutely unrealistic—that instead seemed lifted directly from our (and Germany’s) collective, nightmarish unconscious. (Paradoxically, this period of film production also bred the most effortlessly sublime creator of film comedy: Ernst Lubitsch.) These movies were starkly realistic and horrifyingly unrealistic, devoted to contemporary politics yet existing in an insularly cinematic world, made by stylists and philosophers, nihilists and moralists—they were fascinating contradictions. There have been several silent film screenings in the Twin Cities over the last month or two. The Trylon played two classic Harold Lloyd comedies last weekend—Safety Last (1923) and Speedy (1928)—as well as the Douglas Fairbanks actioner The Black Pirate (1926) in June, which was accompanied by excellent live music by The Poor Nobodys. (The Black Pirate was the best moviegoing experience I’ve had in a long time, attended as it was by a few kids who cheered every time Fairbanks’ Black Pirate swashbuckled heroically.) Meanwhile, the Walker, for the last of its four screenings in its Summer Music & Movies program, will be screening Fritz Lang’s Spies (1928) on August 22 with live accompaniment by Minneapolis group Dark Dark Dark. 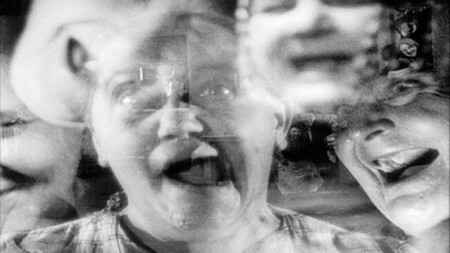 Lang’s 1960 revamp of the Mabuse franchise, The 1000 Eyes of Dr. Mabuse , is also playing as a part of the series, which Jeremy Meckler recaps (and provides a fascinating background to) in this excellent blog post. Perhaps the most viscerally exciting of all of Lang’s German features (which is saying a lot—its competition includes Destiny ; Dr. Mabuse, the Gambler ; Die Nibelungen ; Metropolis; M ; and The Testament of Dr. Mabuse ), Spies concerns a criminal mastermind named Haghi (Rudolf Klein-Rogge, who also played Mabuse). The dizzying opening of the film demonstrates Haghi’s lethal efficiency in orchestrating his three-ring-circus of terrorism: whipping from one elaborate felony to the next (banks are robbed, secret files are stolen, drive-by-shootings are committed, bureaucrats are assassinated), Lang smacks us awake as soon as Spies begins—and in a matter of minutes, briefer than most modern movies devote to their opening credits. After this slam-bang-pow introduction, Lang offers us a foreboding intertitle (“Who is responsible?”) with an almost-immediate, meta-(silent)-cinematic, direct-address response: “I!” The I in question is Haghi himself, who somehow has the agency to reach out of the film’s diegetic space and boldly disseminate his voice via the film’s non-diegetic intertitle. Lang, who often employed intertitles and onscreen text more playfully than many silent-film directors (for example, the flurry of numbers that drift past the brainwashed head of the Chief Inspector near the climax of Dr. Mabuse, the Gambler), here provokes and baffles his audience by ceding Spies’ authorial address to his all-powerful supervillain. Haghi is not only a counterpart to Dr. Mabuse; he is a precursor to a legion of diabolical badguys, from practically every Bond villain to James Mason’s suave Phillip Vandamm in North by Northwest to the shadowy inner-government conspirators on shows such as The X-Files, 24, and Fringe. 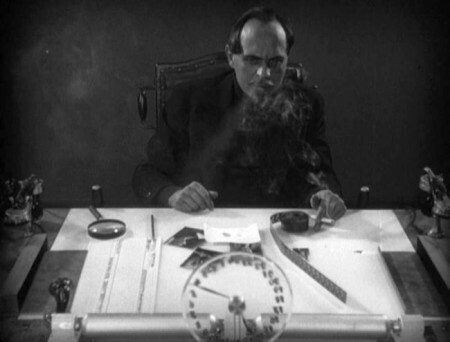 And while Mabuse, as a villainous tyrant, may be more accurately read as a symbolic prediction of the impending rise of Hitler and the Third Reich (especially in 1933’s The Testament of Dr. Mabuse), Haghi, as a coldly calculating mastermind who toys with bureaucrats and politicians with chess-like precision, may be a more potent vehicle for ridiculing Germany’s petty, self-destructing political machine during the Weimar era. After all, Mabuse is ultimately so powerful that he’s driven mad by his own apocalyptic, nefarious ambition—he’s a portrait of an entire country at the cruel behest of one insane tyrant. Haghi acts with emotionless practicality right up to the end—brilliant, Machiavellian, a sinister personification of how capitalist democracy works in the modern age. It may not be too much of a stretch to claim that Haghi also acts as a stand-in for Lang himself. The image of Lang popularized in both the German and the American press (following Lang’s migration to the US in 1935, where he would make films for the next two decades)—an image which Lang seemed to enjoy promulgating himself—was that of a stern, monocled dictator who would literally crack a whip onset in order to orchestrate the movements of hundreds of extras. His films would be planned out meticulously in advance, not only in their production design and camerawork, but even in the miniscule gestures and body movements of his actors, who might be subject to Lang’s horrific temper if they didn’t follow his every direction precisely. The comparison between Haghi and Lang deepens when we consider the character of Sonia in Spies, played by Gerda Maurus. Sonia begins the film as one of Haghi’s numerous agents but ultimately finds herself drawn to a German government agent known only as No. 326 (Willy Fritsch). Indeed, it is Haghi’s love for Sonia—an unrequited love he can’t resist, and whose potentially destructive power he is all too aware of—that may ultimately bring about his downfall. Meanwhile, Lang himself was having a passionate affair with Maurus, his leading lady, despite having married his screenwriting collaborator, Thea von Harbou, in 1922 (they divorced in 1933). Although Lang was well-known in both Germany and the US for striking up romantic relationships with his actresses (or trying to), the sincerity and passion of Spies’ love story between Sonia and No. 326 is still a rare emotional achievement for Lang—one that may or may not be contributed to the director’s fondness for Maurus. It seems too sentimental to claim that both Haghi and Lang are exacting, brilliant dictators shielding their fragile hearts with an outwardly callous hunger for power, but it remains true that Spies is one of the director’s most exciting balancing acts—as messy and volatile in its human relationships as it is precise and astounding in the visceral power of its action setpieces (such as the detonation of a time bomb on a speeding train, which must be seen to be believed). So Spies is one of the most vivifying films from one of the most audacious directors working within one of the richest film movements in the history of cinema; as if that wasn’t enough, because it is the final screening in the Walker Art Center’s Summer Music & Movies Program, it will be screened with live musical accompaniment by Dark Dark Dark, a Minneapolis-based band that has been rising steadily on the underground scene for the past four years. Pitchfork describes the band’s music as “an otherworldly eddy of sound,” swirled together from an unlikely assortment of instruments. It’s an apt description: their music is subtle and sweeping, and therefore seems tailor-made to provide an unusual cinematic soundtrack. 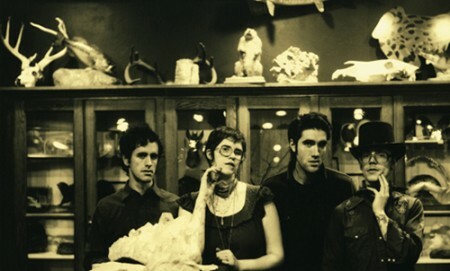 A one-time, leisurely listen to either the band’s 2010 album Wild Go or 2008’s Snow Magic may give one the impression that this is background music, but nothing could be further from the case: repeated listens allow the songs’ unexpected progressions and unique blends of style to become clear, and sad melodies become more indelible and even richer in the mind once their songs are over. It’s exciting to predict how such an eclectic, imaginative, and distinct band will fit into the contours of Lang’s wildly propulsive filmmaking. Theatrical exhibition of silent cinema is something to embrace, especially in comparison to ubiquitous multiplexes that prioritize 3D technology and increasingly lean towards digital projection. Improvements in technology should be embraced and utilized, but more classical forms of exhibition (and storytelling) should, of course, not be neglected in the process. So while Hollywood continues to scramble for the most streamlined (and profitable) way to offer films in 3D—striving for that only-in-the-cinema experience, something Hollywood attempted in the 1950s (as the popularity of home television skyrocketed) with a similar succession of technological attractions—it’s valuable to remember that the narrative techniques, aesthetic syntax, and wide-reaching innovations formulated during the silent area have remained the most powerful and beloved tools for telling stories on film. This becomes irrefutably clear—intensified, magnified—when live music is performed to the projection of silent films. The essence of cinema is purified, distilled, though hardly simplified: watching a story told solely through images with the benefit of an aural counterpart that is similarly expressive—music that responds to image emotionally, intuitively. Poetic sound rather than prose sound. Watching and experiencing silent film not only among a crowd of moviegoers but with a live ensemble of musicians translating sight into symphony, you feel the way moviegoers may have felt eighty, ninety, a hundred years ago, when the rules were not yet written, when cinematic terrain was still uncharted territory. Watching something like Spies today in such a setting, with such audacious sight and sound on display, you feel that it still is. The Walker Art Center’s Summer Music & Movies Program runs every Monday from August 1 to August 22, 2011. For a listing of films, musicians, locations, and showtimes, visit http://calendar.walkerart.org/canopy.wac?id=6308.